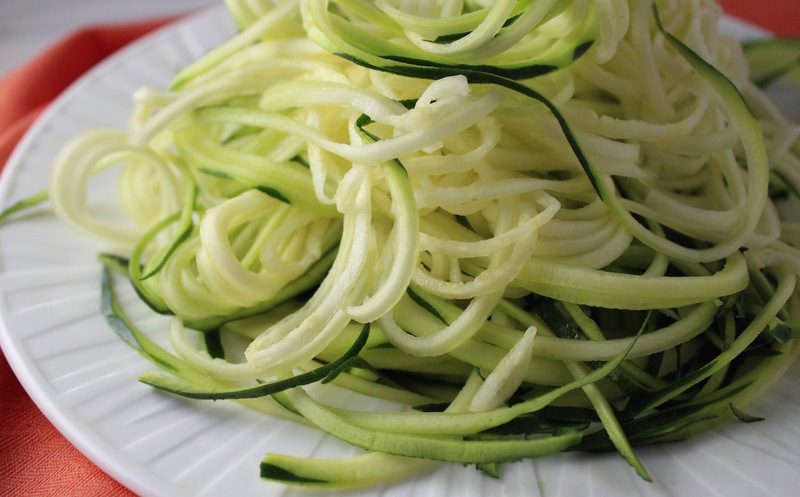 Zucchini noodles (“zoodles” as they’re now called) offer a nice alternative to pasta, so they’re particularly great for folks on gluten free or paleo diets. I finally got on the bandwagon last year and have to say I enjoy them AND it’s fun using my spiralizer tool! I don’t know about you, but I love spaghetti, including the ritual of twirling the precious noodles around my fork. Since pasta is something I’m trying to cut down on lately, zoodles allow me to maintain that ritual! Somehow, I feel like I’m out-smarting my brain, tricking it into thinking that what I’m eating is actually pasta, simply because I can twirl it on my fork. That strategy seemed to work for a while but, lately, I think my brain is onto me because it seems to be rebelling. Sometimes I can hear a voice in my head saying “NO, NO, NO! THIS IS ZUCCHINI!” Whatever. At least when I eat them, I feel a little better, knowing that I’m cutting down on carbs. 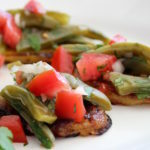 Because zucchini is relatively tastless, it pretty much takes on the flavors of what it’s paired with, so that’s where you can get creative. For this dish, I had some grape tomatoes that needed to be used, so I thought a spicy tomato and garlic ‘sauce’ would make a nice base, along with fresh corn and topped with basil. It ended up being a very simple dish to make, yet quite tasty. 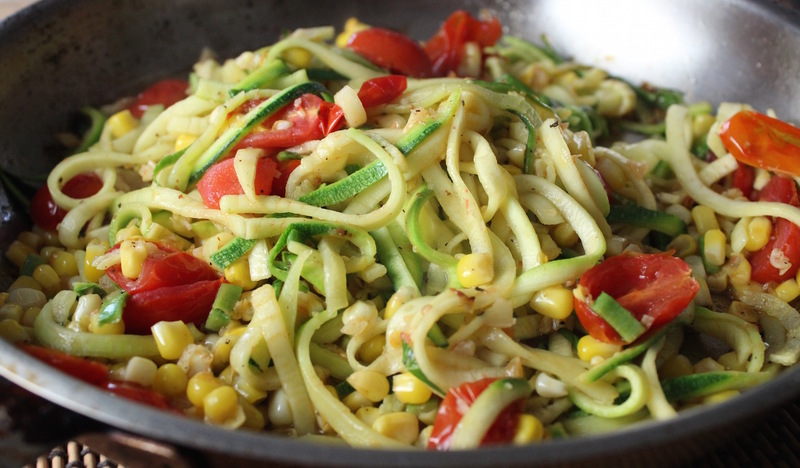 Zucchini noodles are extra delicious with fresh corn, tomatoes and basil. Follow directions for spiraling zucchini, depending on the equipment you have. Set aside. Fill a small saucepan with water and add corn on the cob. Simmer on medium/low about 6-8 minutes. Remove from heat, drain water, add cold water and allow to cool for a few minutes. When corn has cooled, remove kernels (simply stand the cob up straight and scrape down each row with a chef’s knife). Set aside. In a large saute pan add olive oil, red pepper flakes and garlic. Cook about 2 minutes over medium heat. Add tomatoes. Cook on medium/low until tomatoes blister a bit (this takes a few minutes). Add corn kernels and sprinkle with salt and pepper. 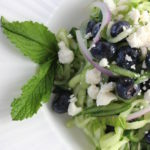 Add zoodles and mix with kitchen tongs. Allow to simmer a few minutes so flavors combine and zucchini warms up. Add lemon zest (optional), basil leaves and serve. Thanks for that. Lots to choose from. Good to get a recommendation. 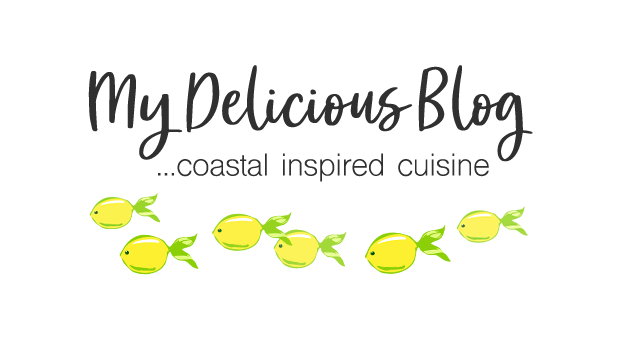 I will let you know how my Zoodles come out!! Do you have a favorite spiral slicer you like to use?? Hi Kandy. I’ve been using a Veggetti – it’s small, easy to use, has 2 thickness options, and is easy to store. I got mine at Bed Bath & Beyond for about $15.